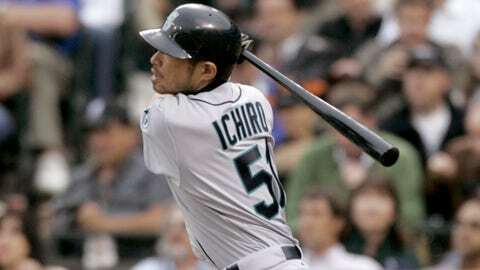 Ichiro recorded three hits in the 2007 All-Star Game in San Francisco. The commencement of the 85th Major League Baseball All-Star Game on Tuesday night in Minneapolis will likely create some of its own history at some point — the city is no stranger to some of the most unlikely moments among ASG festivities — but the previous 84 games have, in the aggregate, helped create a cornucopia of statistical oddities. • There have been only 22 rookie starters in ASG history. Joe DiMaggio was the first in 1936. Frank Robinson did it in ’56. Rod Carew in ’67 was another, as was Fernando Valenzuela in 1981 (only the third pitcher ever, at that time). But the last time it happened was in 2008 — when the Cubs had two rookies start in the same ASG for the only time in history: catcher Geovany Soto and center fielder Kosuke Fukudome. • The most ASG selections is 24, held by a few players, but the record for best winning percentage goes to Steve Garvey, who went 10-for-10 as a National League All-Star. His first win came in 1974, when he became the last ASG starter to be voted in by the fans as a write-in — he was subsequently named the game’s MVP — and his final selection came in 1985, when he participated in the first Home Run Derby a day before he got the winnig hit at the old Metrodome in Minneapolis. Both Joe Morgan (9-0) and Tom Seaver (8-0) come close, but no one has equaled Garvey’s double-digit perfection. • Don Drysdale holds the all-time record for career ASG strikeouts with 19, and 15 pitchers have recorded at least five strikeouts in a single ASG — Pedro Martinez in 1999, of course, being the last. But only seven pitchers have done the "perfect inning" appearance: three batters faced, three strikeouts, and no more. The last one: Jose Valverde to close it out in 2010. His lifelong dream of being an All-Star Game bat boy may never come to fruition, but you can follow Erik Malinowski on Twitter at @erikmal and email him at erik.malinowski@fox.com.